The duo will be some of the youngest sailors to ever race 49er in the Olympics as Sebastien placed 3rd at the 2013 youth worlds in the radial. They have been consistently mid silver fleet to date in their career and will no doubt be looking for a great Olympic experience to take forward into a campaign for 2020. After the Swedish Olympic Committee denied their sailors a chance in Rio, the berth fell to Canada on the basis that they were the next highest placing country at the 2015 World Championship not yet qualified. Sail Canada also opted to reject the berth, deciding that none of their 49er teams met their internal standards. Therefore, the berth went to the next best placed team from the 2015 World Championship, the Swiss, who snapped it up. The competition in Rio will be hot, with odds on favorites Peter Burling and Blair Tuke on everybodies radar. Rio is notoriously tricky, there are all sorts of distractions both on and off the water, and it’s likely the event may end up short of races. The most sure fire bet ever in 49er sailing is much more precarious than most realize! Nathan Outteridge and Iain Jensen (AUS) have been on a roll of late, winning the latest act of the America’s Cup and back consistently on the podium of 49er events they enter. The chasing bunch includes a post Olympic gold medalist (DEN), two top Europeans at the last two European championships (GER and ESP), and two medalists from the most recent 49er World Championship (AUT and GBR). Rounding out the other contenders are young guns Yago and Klaus Lange (ARG), light air specialists from POR and FRA, the Polish duo of Lukasz and Pawel who seem to always be just off the podium, and the mercurial Irish, who are able to break onto the podium every now and then. 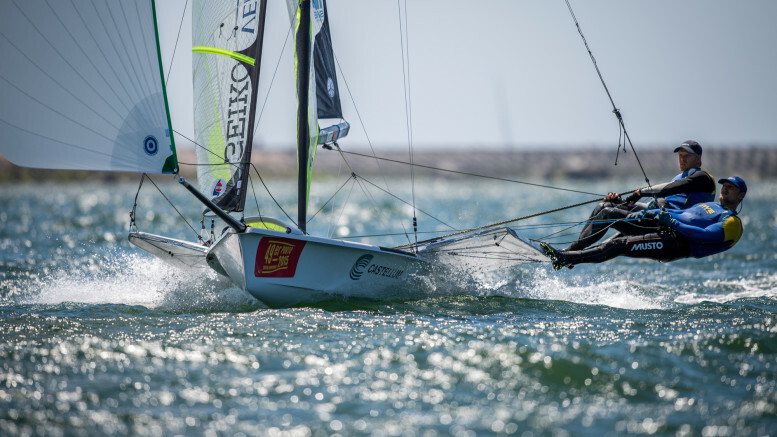 The Australian federation is still holding onto the final 49erFX Olympic berth despite publicly saying they will not send a 49erFX team to Rio. Tess Lloyd and Caitlin Elks have taken their case to the court of Arbitration for sport in order to win a final appeal to go to Rio. A massive facebook page and petition have been launched to support their fight against their MNA. If they fail in their appeal the berth will go to the Croatian team.